Here are some helpful answers to frequently asked questions about visiting the house and grounds at Waddesdon. Our visitor car park has over 1,000 spaces and is clearly signposted upon arrival. There are dedicated spaces for Blue Badge holders and families, available on a first come basis. How do I get from the car park to the manor? A regular shuttle bus service runs a circular route. You can pick it up from the Welcome Pavilion at the car park and get on and off at the fountain near the house, the Stables and back to the car park. There is then a short, flat walk of 200m from the North Fountain to the house and a mobility assistance vehicle is available for this journey if required. What time do the shuttle buses run? During winter weekends (January to March) the last bus returns to the car park at 4.30pm. Can I take a pushchair on the bus? Yes, each shuttle bus has space at the front for up to five pushchairs without folding them. Can I walk to the Manor from the car park? Yes, there is a footpath route linking the car park to the main gardens, on steep sections this is paved, on the flat it is a mown grass path. The grass sections can be muddy or slippery after heavy or prolonged periods of rain, sturdy footwear is advised. Can I charge an electric vehicle? We’ve four spaces in the visitor car park signposted for the purpose of electric vehicle charging. The socket available in all spaces is an EV Type II, we don’t have any connecting cables, so please remember to bring yours with you. Use of the posts is free, but on a first come, first served basis. Why is entry to the house by timed ticket, and do I need a ticket? We are very fortunate to still have most of Waddesdon’s original collection intact, however this means that many of our corridors and walkways are very narrow. In order to prevent overcrowding, and for our visitors safety and comfort, we need to control the number of people entering the house at any one time. Doing this by timed admission ticket allows you to plan the rest of your visit without worrying about queuing to get into the house. Therefore everybody, including under 5s need a timed ticket. What is the last entry time? Last recommended ticket time is 2.30pm in order to see the house fully. Last entry time is 3.10pm, from this time you may see our House Stewards begin the process of closing for the day. I’m a National Trust member, do I need a timed house entry ticket as well? Yes. Between March and October entry is free, but everybody, including National Trust members, will need a timed ticket to enter the house. This is necessary to prevent overcrowding. From November to March the house is ‘put to bed’ for cleaning and conservation. At Christmas some rooms are decorated from November until early January, booking is essential (charged). Can I book a timed ticket before my visit? Yes. Tickets can be pre-booked through our website or by phone on 01296 820414 (booking fee applies). On weekends and in holiday periods tickets sell out quickly, and advance booking is advised in order to avoid disappointment. Tickets are also available from the Welcome Pavilion in the car park on arrival, and a small allocation is held back for sale on the day. We encourage weekday visits if you would prefer to avoid the busy times. Is there a guided tour included with my house entry ticket? No. Once in the house you are free to explore at your own pace, our knowledgeable House Hosts are on hand to answer any questions you may have. For those that would prefer a tour, we run a series of tours and events outside of normal house opening hours, which can be booked in advance. 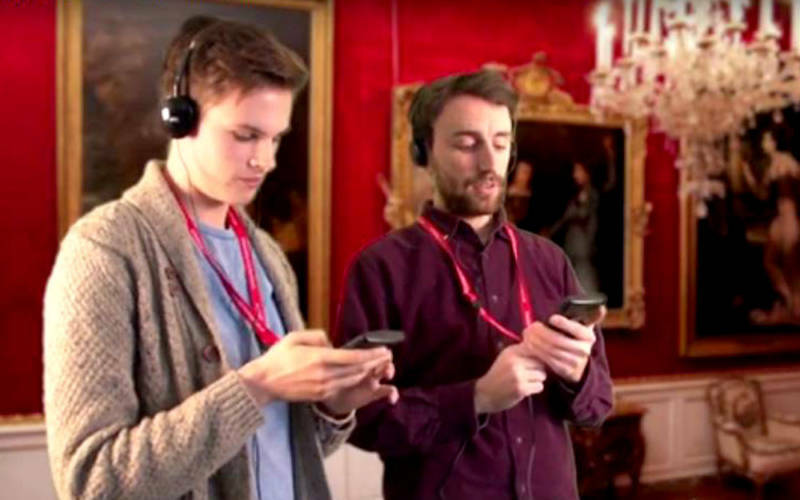 Handsets with house tour guides are available to hire at Visitor Information prior to entering the House for £3 per handset. Available in English, French, German and Mandarin. How long does it take to see the house? We recommend a minimum of 1 hour 30 minutes in order to appreciate the house to its full. On average people will spend two hours visiting the house. What is the latest entry time for the house? Last entry to the house is 3.10pm. However we recommend entry to the house by 2.30pm to ensure that you have enough time to fully enjoy all that the house has to offer. Why does the house close earlier than the grounds? One of the greatest enemies in preserving a collection like Waddesdon is exposure to light. We have a strict number of hours in a year that the rooms can be exposed to light and therefore open to the public. It is in order to take care of the collections that we need to close slightly earlier than the rest of the property. Can I take photographs and videos of the exhibits? We are happy for you to photograph and video our collections for personal and non-commercial use. Feel free to share them with us and on social media #MyWaddesdon. We ask that you refrain from using flash photography as our collections are extremely light sensitive. There may be some items or displays that are on loan from other organisations who have stipulated that items cannot be photographed as part of the loan agreement. These will be clearly sign posted as ‘No Photography Allowed’. Note: Permission is required for all professional photography. Contact Kim Hallett on 01296 653240. Can I take my bag into the house? Yes, but not oversized rucksacks (those with a frame), suitcases or picnic hampers. Many of our corridors and walkways are quite narrow, with delicate items in easy reach. To avoid accidental knocks and scrapes large bags must be left in Visitor Information, where they will be tagged and stored securely for you to collect at the end of your visit. To help us look after the collection, we ask that visitors carry all bags and rucksacks around the front of them during their visit. Can I take a drink or snack with me into the house? Many of our carpets and textiles were made before the invention of modern dyes and fixatives, even very small spillages could lead to irreversible damage to these items. Our priority is to care for the collections, so you will be asked to leave any food or drink at the Visitor Information. It will be tagged and available to collect at the end of your house visit. It’s a hot day and I don’t think I’ll make it around the house without my water? We have places in the house where water is available on hot days, and kept away from any vulnerable items, please ask any member of staff for assistance. Can I wear high-heeled shoes in the house? For your ease and comfort we advise leaving your high heels at home. We provide alternative slip on footwear for those wearing high heels, because sharp pointed shoes can cause damage to the historic floor coverings. Can I bring a pram or pushchair into the house? We provide front sling or hip-carrying seats for small children, available at the house entrance free of charge. Unfortunately prams and pushchairs are not allowed into the house as the visitor route is narrow and they may inadvertently cause damage. Can I feed or change my baby inside the house? Our collection is fragile, with many historic textiles that are vulnerable to any accidental spillage of food or liquids including water. However, there are areas around the House which are less sensitive where you can feed your baby. Please ask a member of the house team for assistance. We also have private facilities on the ground floor of the house for baby feeding should parents wish to use it. Can I carry a child on my shoulders within the house? Children may not be carried on shoulders during the house visit, for safety reasons. The route through the house is sometimes narrow and you may be in close proximity to other visitors and also fragile objects in the collection including chandeliers, paintings, sculpture, wall hangings and original curtains. Can I use phones/tablets within the house? Yes. We have a number of apps that can be downloaded to your devices and there is also free Wi-Fi within the house (simply log in with your email address). Please however refrain from making calls within the house, out of courtesy for other guests. Does the house have wheelchair access? Yes. Most areas of the house are accessible, however, there’s limited access to the Prints and Drawings Rooms, and Wine Cellars. Our historic lift, which services the first floor, is quite limited on space and not all scooters or wheelchairs can be accommodated. We’ll be able to advise on whether your mobility aid will fit in the lift at the point of admission to the House. On occasion we may request that a mobility scooter or wheelchair user transfer into one of our house wheelchairs upon arrival at the house entrance. This is usually because your mobility scooter or wheelchair is too large to accommodate, or the wheels maybe muddy during the winter months. However, if for any reason this isn’t possible, you’re welcome to use your own scooter or wheelchair on the ground floor. We have four wheelchairs suitable for use inside the house which are located in the main entrance and are available on a first-come, first-served basis. Are walking frames allowed within the house? There are a variety of food and drink locations on site. The Manor Restaurant serves sit down breakfasts, lunches and afternoon teas and the Stables Café serves light lunches, cakes and coffees. 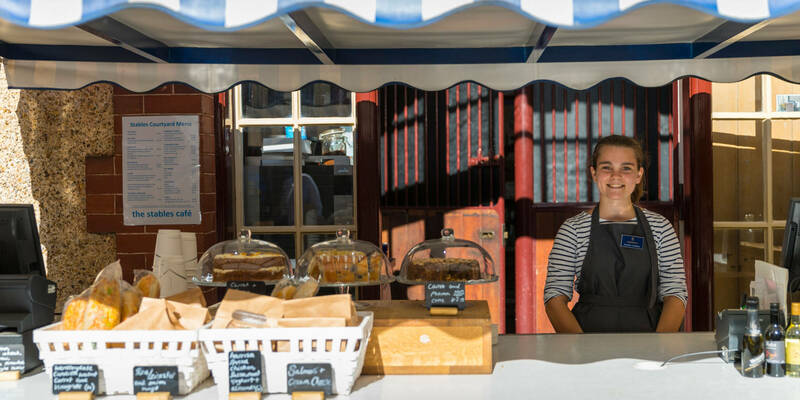 The Coffee Bar has warm drinks, freshly made sandwiches and cakes to take away and the Summer House serves take-away drinks and snacks. We will have a new Wigwam Cafe with covered seating located ear the top of the Woodland Playground during Christmas. Are dogs allowed into the grounds? Dogs are welcome anywhere in the grounds with the exception of the Aviary, Parterre and Woodland Playground. Use our dog map to see our dog friendly areas. Dogs are not allowed inside any building including the house, shops and catering outlets or on the shuttle buses. Please keep dogs on short leads at all times. Dog water bowls can be found at the stables. You may sit with your dogs in the Stables Courtyard for outdoor refreshment. Can I bring a picnic to Waddesdon? Yes. You are more than welcome to enjoy our picnic benches or bring a blanket and enjoy the gardens. Either bring your own food or pick something up from one of our food outlets. 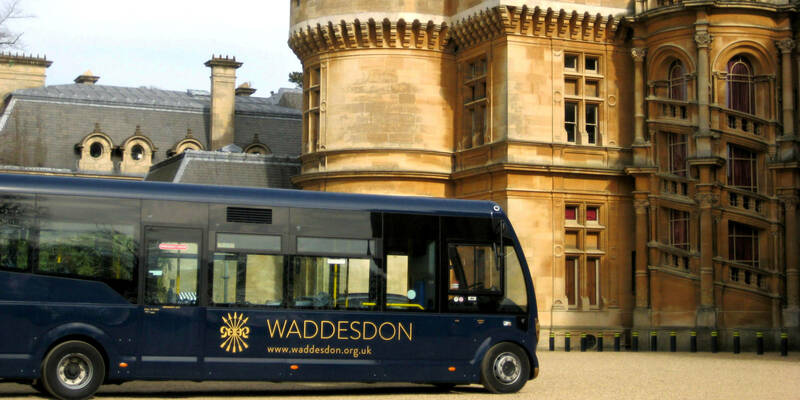 In advance of the Waddesdon Greenway, a new safe cycle and walking route joining Aylesbury Vale Parkway to Waddesdon Manor being open, we are allowing cyclists to use their bikes on the main route through the grounds. On arrival you will be directed to our Welcome Pavilion, where you’ll need to purchase a grounds entry ticket, or show your National Trust membership card. If you wish you may leave your bike in our sheltered rack next to the electric charging points and continue into the grounds via our free shuttle bus. Alternatively, you may cycle up to the Manor along the main entrance road. Please dismount when you reach the closed main gate, and walk your bike through using the side pedestrian gate. Once through this gate you may continue cycling on the entrance road to the North Fountain. At this point a member of staff will show you where to safely leave your bike in a sheltered bike rack. We permit small bicycles used by supervised under 5s within the main gardens. These can be carried onto the visitor shuttle buses. Please ensure that any under 5s stay on the main paths within the gardens. We suggest the flat paths in front of the house, around the Aviary and the Rose Garden are most suitable. Smoking is prohibited within 20m of all buildings for health and safety reasons. You are permitted to smoke within the grounds and gardens, but please be respectful of other visitors and dispose of your cigarettes within the bins provided.